Direct Mail Marketing System For PrintersYou print direct mail advertising for your customers every day. Now it's easy to do the same for your own business, but with a unique advantage – it's like buying your advertising at cost. Download your choice of mailers from our library, drop in your logo and contact details and you're ready to go. Email Marketing System For PrintersThe economy and ROI of email marketing are undeniable, and combined with direct mail, email and online marketing tactics can boost your overall results to new heights. Choose complete email messages from our library, customize and personalize them automatically, send and track your campaigns. Lead Generation System For PrintersFor most small printing businesses, finding a steady supply of potential new customers to engage in the sales process is the missing link to marketing success. Now you can engage qualified print buyers economically with "set-and-forget" campaigns, capture their contact details and follow up automatically. Web Traffic Building System For PrintersYour website can only generate income if it gets traffic. Unfortunately, far too many printers' sites are simply gathering virtual cobwebs, because they were built with no mechanism to attract visitors. Now you can attract print buyers with a simple but powerful add-on to your existing site. Social Media Marketing System For PrintersDespite the hype and exponential growth of social media tools, ROI and solid results have been elusive for printers – until now. We have mapped out paths to profitable outcomes in the social media space. Let us be your guide to generating real, tangible results for your business with social media. The Printer's Marketing System is a comprehensive suite of tools to make marketing your printing business easy, affordable, and effective. The Power of the System You already rely on systems in almost every aspect of your printing business. Now you can systematize your marketing too. Integrated Campaign Components System components work together to create a pipeline of prospects and keep customers engaged through multiple channels. Ready To Send Content Forget the hassles of creating your own advertising, and the expense of agencies or freelancers – just browse the extensive content library and make your selection. It's all done for you and ready to go. Automated Marketing Set up your electronic campaigns once and they stay productive round the clock, month in and month out – your marketing is taken care of when you are busy with other things – even when you are out on vacation. Easy Implementation All our systems are created to be easy for busy print owners and managers to set up and run. Your campaigns are supported with strategy and planning tools, to help you generate optimum results. Economical Subscriptions You can choose the campaign elements you want to get the most marketing horsepower for the outlay that's right for your business. Subscription arrangement means modest, predictable costs. The Printer's Marketing System membership plans let you choose the marketing campaigns and tools you need from these six modules. Direct Mail Marketing You print direct mail advertising for your customers every day. Now it's easy to do the same for your own business, but with a unique advantage – it's like buying your advertising at cost. Download your choice of mailers from our library, drop in your logo and contact details and you're ready to go. Email Marketing The economy and ROI of email marketing are undeniable, and combined with direct mail, email and online marketing tactics can boost your overall results to new heights. Choose complete email messages from our library, customize and personalize them automatically, send and track your campaigns. Lead Generation For most small printing businesses, finding a steady supply of potential new customers to engage in the sales process is the missing link to marketing success. Now you can engage qualified print buyers economically with "set-and-forget" campaigns, capture their contact details and follow up automatically. Web Traffic Building Your website can only generate income if it gets traffic. Unfortunately, far too many printers' sites are simply gathering virtual cobwebs, because they were built with no mechanism to attract visitors. 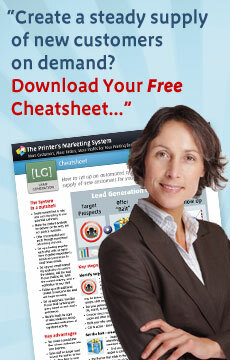 Now you can attract print buyers with a simple but powerful add-on to your existing site. Social Media Marketing Despite the hype and exponential growth of social media tools, ROI and solid results have been elusive for printers – until now. We have mapped out paths to profitable outcomes in the social media space. Let us be your guide to generating real, tangible results for your business with social media. Marketing Strategy and Planning You can't reach your marketing goals without a solid plan, and without the basic building blocks of brand, messaging and selling proposition. Now you have the tools to create these easily, making all your marketing activities more productive and profitable.